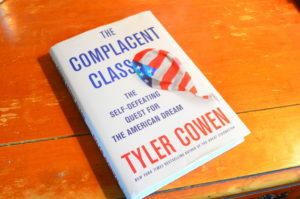 Rarely have I read a book with which I have so thoroughly disagreed as Tyler Cowen’s The Complacent Class: The Self-Defeating Quest for the American Dream. I had hoped for a perspective on what is behind American decadence. However, at every chapter, I bristled with objections. 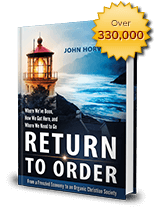 Racing through the book about complacency, I felt I could not be complacent by simply reading it uncritically. Not everything in the book is flawed. I do agree with Cowan’s main point. America is losing its dynamism. The author is a well-known economist who knows his field. In his slightly over 200-page text, he does provide plenty of evidence of American decline. However, beyond these conclusions, we do not agree about much more. His conclusions are not the problem. After all, they are evident to any observer of the American scene. The problem is his list of causes of American complacency. The reader might expect some nod to morality. What the reader gets instead is narrow economics. Far from being dynamic, his book is a rather staid restatement of old economic theory and recycled business cycle models. Thus, I felt exasperated by the 800-pound moral values gorillas ignored in the book. The more the gorillas waved their hands, the more the author seemed to focus on materialist sacred cows. Of course, Cowen is free to disagree about the causes of complacency. But what bothered me is that he simply ignores even the remote possibility that moral choices might be part of the story. The gorillas are ignored. The sacred cows steal the show. For example, Cowen concludes that America is losing its dynamism due to an aging population. That makes sense. His analysis of the cause doesn’t. Cowan treats the aging population as if it’s an individual. But a population only ages if it does not have enough babies to replace old people. If you don’t want an aging population, then have more babies. This isn’t rocket science. Alas, Cowen fails to mention contraception, broken families, and a disdain for large families. The fact that some 59 million young people have gone missing due to abortion makes not a blip. Instead, Cowen acts as if nations simply age and we need to figure out how to overcome the complacency that results. The cures he considers are mostly economic. Perhaps more wealth, automation and customs might bring back slightly larger families. In a similar way, the author is obsessed with segregation. America is indeed polarized and voluntarily segregated now more than ever. Ironically, the most segregated places are often the most politically liberal. Think San Francisco, Austin or New York. However, much as he does with demographics, the author assumes such segregation must be caused by income, education, social class and algorithm-driven “matching.” Again, moral questions play no role — even though he knows about contrary data. He even cites Charles Murray and Robert Putnam, authors who have shown that social and family breakdown are key causes of segregation. Rather than ponder how moral choices affect our economy, he treats morality as just the tail wagged by an economic dog. Wealthy and educated people, he thinks, adopt a “high-stability set of norms” of marriage and stable families. Their counterparts of “less-educated lower earners” adopt “less-stable social and marriage norms.” Now that we can use matching services to find like-minded people, we become even more complacent and segregated. For Cowen, economics and technology, not the moral choices of real people, are always the driving forces. If America is now sluggish, then what might a dynamic society look and feel like? For Cowen, the model, “for all of its flaws,” is China. Given Cowen’s tin ear for morality, this is not surprising. If dynamism isn’t based on our desire to create value and provide for our families, but rather on restless ambition, then China certainly fits the bill. A few million human rights violations should not be held against this corrupt communist regime. At least it’s dynamic. Cowan thus makes restless change itself a good. To him, a kind of frenetic intemperance is thus the antidote. In place of a moral core that provides the stable basis for real progress, this restlessness becomes that core. He ends with an uninspiring rallying call to re-embrace restlessness to avoid a major fiscal and budget crisis. The complacent class needs much more than an economic pep talk. It needs a renewed moral commitment to family, faith and community. This entry was posted in Featured and tagged America, book review, complacency, economy, frenetic intemperance, society, The Complacent Society: The Self-Defeating Quest for the American Dream, Tyler Cowen by John Horvat II. Bookmark the permalink.